After attending these multiple events, we have come to strongly believe that collaboration and knowledge-sharing is the lifeblood of innovation. We were fortunate to gain valuable perspective through each and every interaction, and proud to further establish CODA’s unique offering in multiple arenas, from utilities to solar to clean tech. On October 1st, at one of the energy storage industry’s largest events—Energy Storage North America (ESNA) our CTO and COO, Pete Norton spoke on a well-received panel with Al Baez, Program Supervisor at our partner South Coast Air Quality Management District about our joint project that demonstrates the role energy storage can play in reducing greenhouse gas emissions and criteria pollutants, while supporting a resilient grid. The audience received an insider’s view into a successful, collaborative public/private partnership that resulted in a marketable energy storage solution and created the intended environmental benefits. Throughout the breakout sessions, on the EXPO floor and in conversation, we observed a distinct shift to a more economic focus this year and a greater emphasis on promoting ideas and what companies are doing, rather than individual products and technology. The idea of cooperative competition, or “coopetition” surfaced as another theme. Our industry is experiencing a “rising tide raises all boats” phase as we all seek to optimize energy solutions by combining existing and new technologies into hybrid systems and looking at competitors as potential partners. We left the conference charged with optimism about the growth and opportunities of the industry as its clear there is still room for many players, and many more technologies—in fact, the diversity and coopetition is critical for moving the needle for the industry as whole. We were also pleased by the level of excitement that Jeff St. John’s piece in Greentech Media stirred up in advance of the show. We had multiple potential customers asking us about CODA’s energy storage solution – and many of them had even printed copies of the article for reference. There was never a dull moment at the CODA Energy booth. Thanks, Jeff! The following week, VP or Product and Marketing, John Bryan traveled to a place where the sun is an abundant energy source – Palm Springs, CA – for the Southern California Energy Summit to participate in a breakout session focused on advancing rooftop solar + energy storage. While conversations around these applications often revolve around residential applications, John was excited to share the impressive and often overlooked financial and operational benefits commercial and industrial customers can gain by complementing solar arrays with distributed energy storage systems like the CODA Core. John discussed the economics of solar + storage at another speaking engagement at the next conference CODA Energy attended in San Antonio – the long-running Itron Conference for the utility industry. While he made some valuable new connections at Itron, John didn’t leave with the same sense of opportunity and enthusiasm as previous conferences, as CODA focuses on a customer base of commercial and industrial businesses. At Solar Power International, a vendor focused conference in in Las Vegas, the dominating conversation was largely a business one: how to improve profit margins for the solar industry. Yet, we saw the theme of coopetition emerge again, which more and more consultants seem to be banking on, using their expertise to help clients navigate the various technology and understand how they work all together. In fact, CODA Energy was hosted at two of our partners’ booths, Ideal Power & the International Brotherhood of Electrical Workers Union. This arrangement gave us more opportunity to share CODA’s offering and show how our technology can be part of a solution in a more compelling way. We wrapped up the month in San Francisco, re-energized (pun intended!) 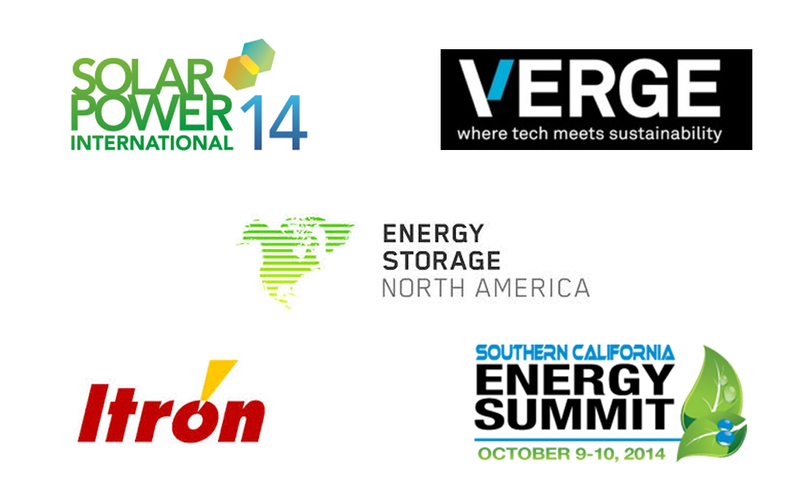 to meet some of cleantech’s biggest movers and shakers at the annual VERGE conference. All the elements of the grid, renewable energy and batteries came together in the big picture perspective at the conference. Each year VERGE brings together a multidisciplinary community pursuing the next frontier of sustainability built upon converging technologies for energy, buildings and transportation, and this year the conference was bigger than ever. CODA Energy’s vision for a future of energy resilience was reflected in the panels and breakouts that make up the Distributed Energy Systems track, and we hope that next year there are more focused sessions on specific energy storage applications, such as control systems reinforcement. All in all, this month has made it even more evident that energy resilience has entered the mainstream conversation for businesses, policy makers and the media, and is being recognized as a critical component of economic and societal prosperity.